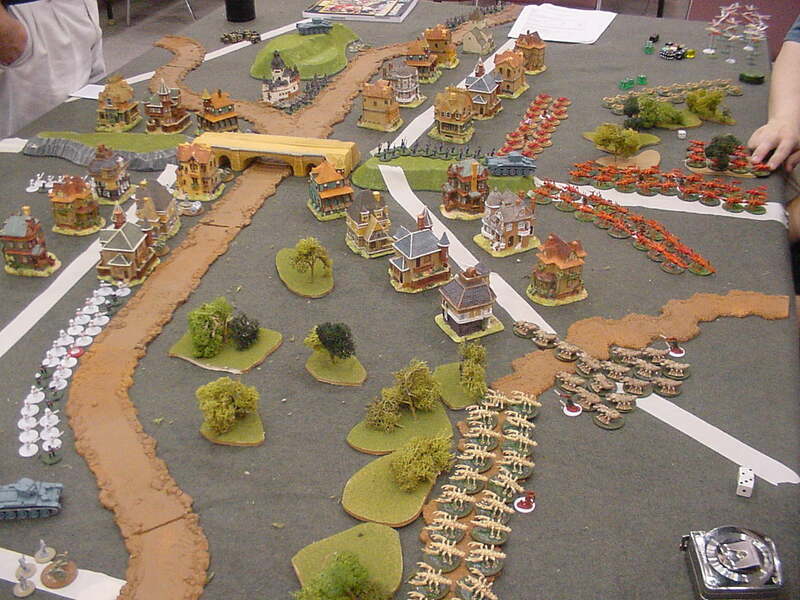 I saw some photographs of Terry Sofian's games of his bug wars set in Victorian Devon and Cornwall. The actions take place near Honiton, Devon. I just had to put them on the web so you could see them! The figures are mostly from Scott Flower at Gametech. Scott and Terry designed the bugs, Terry sculpted some basic forms, Scott did the bulk of the work sculpting them to finished form, made the moulds and cast them. 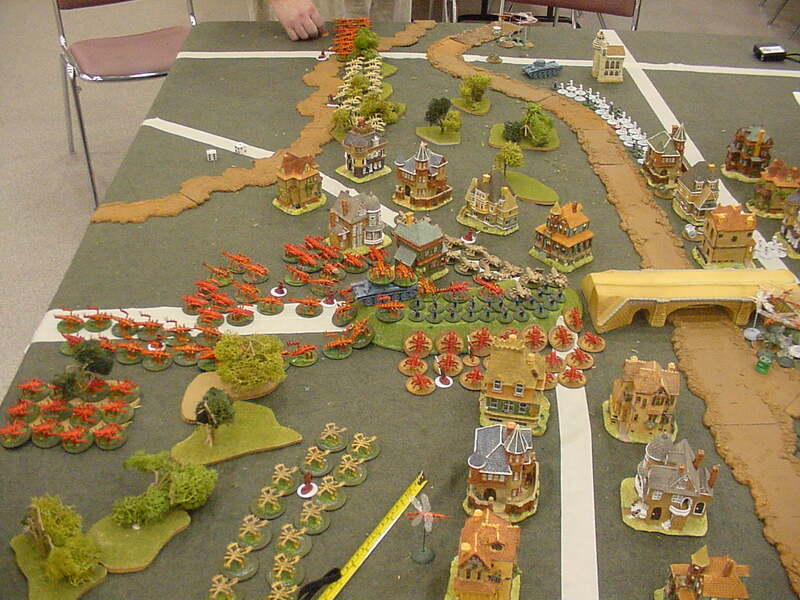 The grub like ones are from Germany, the 15mm Demonworld line. The drones are old Ral Partha Insectmen warriors. Scott is taking a few months off from casting (sadly) but when they are available again Terry will let you know. A Company of the 24th Foot advances behind a coal fired land juggernaught. The British troops are supplied by John Bancroft. The Juggernaught is a Games Workshop Chimera converted to carry a 20 pdr gun, 2 x 3 pdr Hotchkiss Rotary Cannon and a .5 inch Gatling. Dawn - The morning mist rolls back to reveal .... BUGS! The Hordes of Hell and as thick as grass! 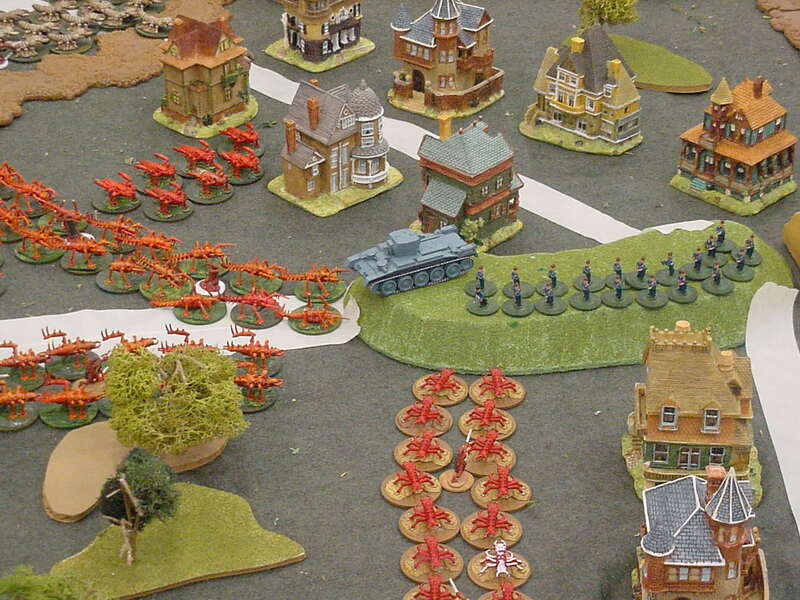 Terry Sofian explains the Bugs Rules for the rule set "Soldier's Companion". Bring up the Rations! - Tom tries to distract his opponents with food. 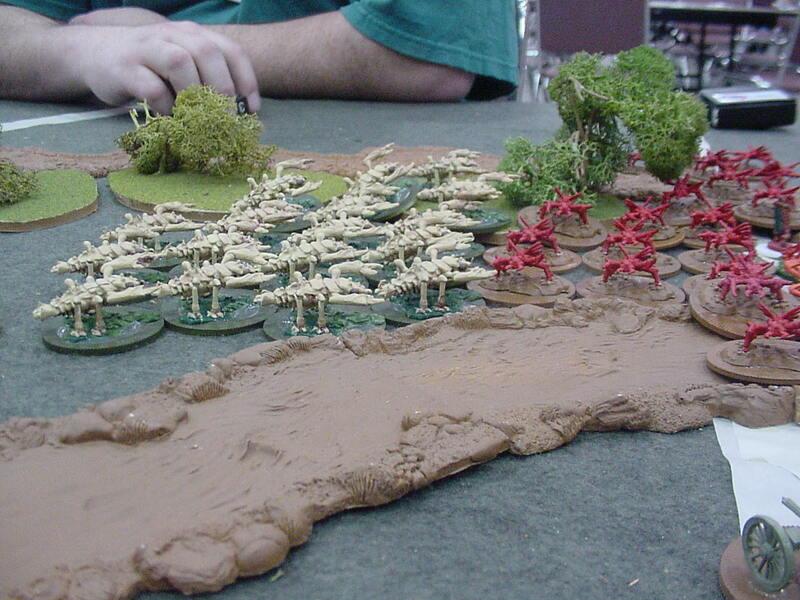 The Horde - the bugs close in on the British line. 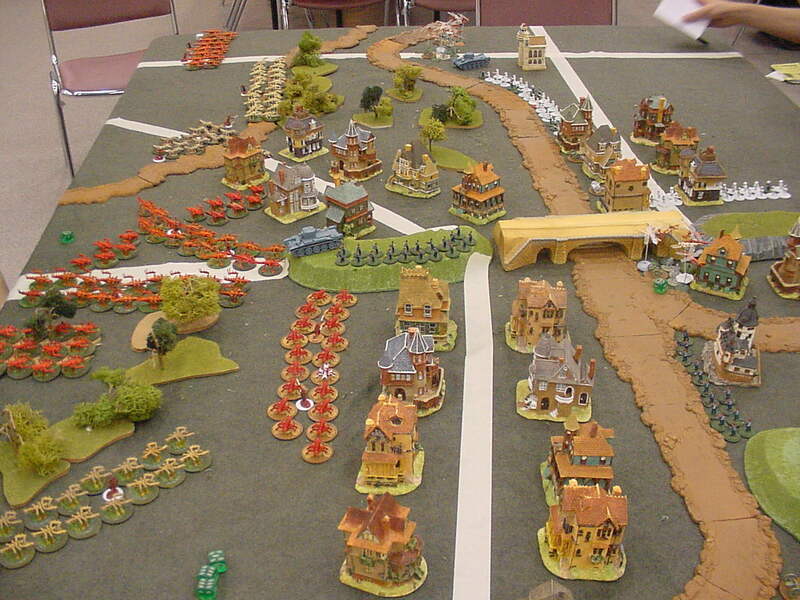 The British Left Flank. 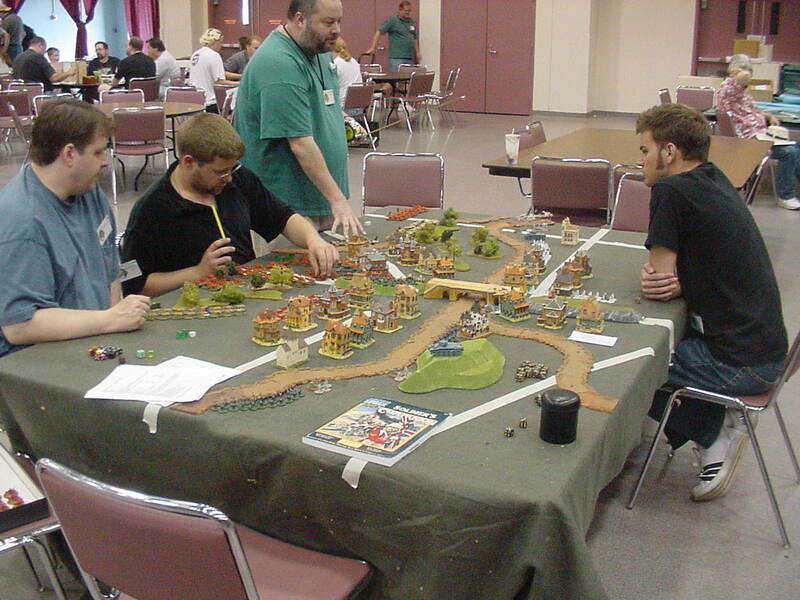 The majority of the British are Ral Partha and Rafm figures. A squadron of lancers tries it on with the bugs. You can see abandoned guns in the background. The Figures in this action are mostly Frontier Boxer Rebellion line, with Old Glory Zulu War line infantry. 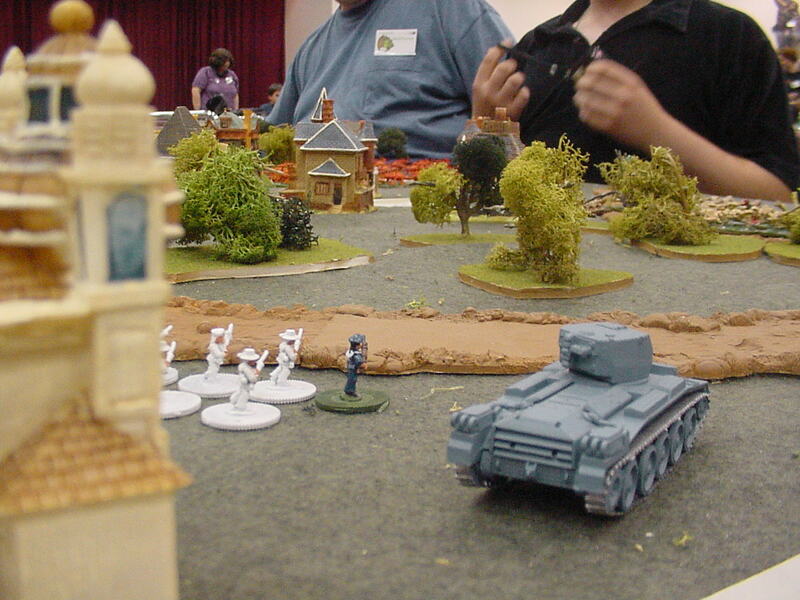 Vehicles are converted from Airfix Crusaders in 1/72 scale. The howitzer turrets are Quality Cast Bishops with the gun cut down, the flamethrower turrets are also theirs, from one of the British early war light tanks. The rest of the Turrets are Battlefront from New Zealand. Their stuff is excellent, they give excellent service and they will treat you right! The small turrets are off the A-9 Cruiser tanks, the Big 12 pdr turrets are Cromwells with the gun being a German 75mm off a Panzer 4H, with the muzzle break removed. The engineer vehicle turrets are from Churchill AVRE for the spigot mortar main turrets. 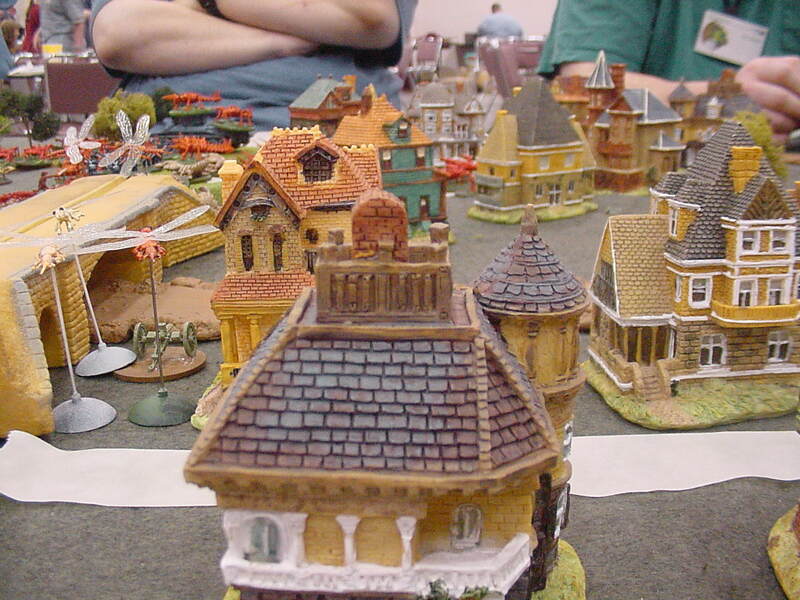 Terrain is mostly resin houses from the local discount store, (a dollar a piece!) with Armourcast rivers. This morning a large raiding column of insects broke out of Devon, across the River Otter and into the town of Honiton. The purpose of this raid was apparent when a large store of food was carried off back to the Hive. Casualties amongst the defenders, primarily Royal Marines and members of the Naval Brigade, were heavy. The action began with reports from the outposts of the Taunton Stop Line of an incursion by large numbers of the hideous creatures. The line before the abandoned town of Honiton is at its weakest, since the close proximity of the River Otter was deemed to give the defenders' additional protection. This proved to be a bloody mistake as the aliens were able to force the river line in two places and send raiding columns into a huge supply depot, carrying off hundreds of tons of stores and creating havoc miles behind the alleged defense line. Having some short warning H.M. forces in the area were able to stand to and meet the aliens. The defenses consisted of a battalion of Royal Marines, a battalion of Naval Brigade, several Naval Brigade machine gun sections and three sections of the new armoured carriage mounted five inch howitzers. 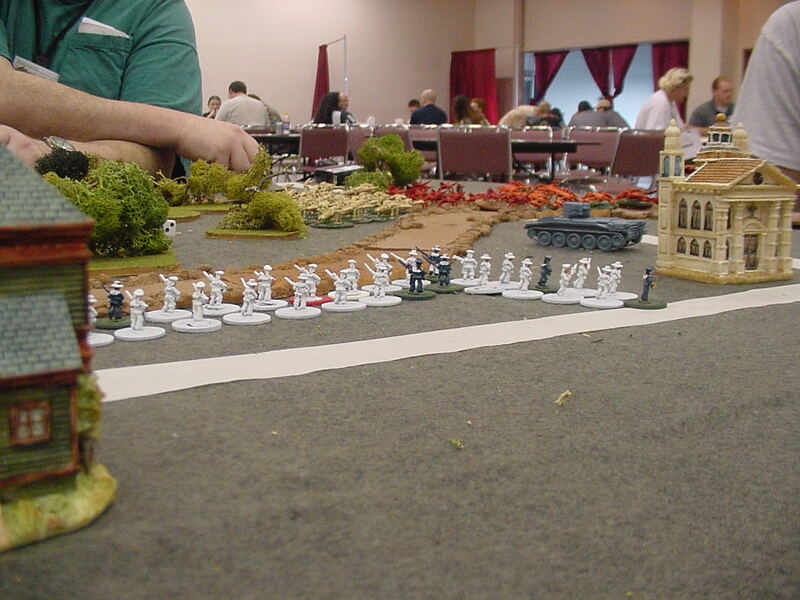 Additional forces were brought into combat as the action progressed. Col Barnes (player name) R.M. was in overall charge of the the sector of the line. He disposed his forces to cover the river banks, the bridge on the Cullompton-Dorchester road and a nearby ford. 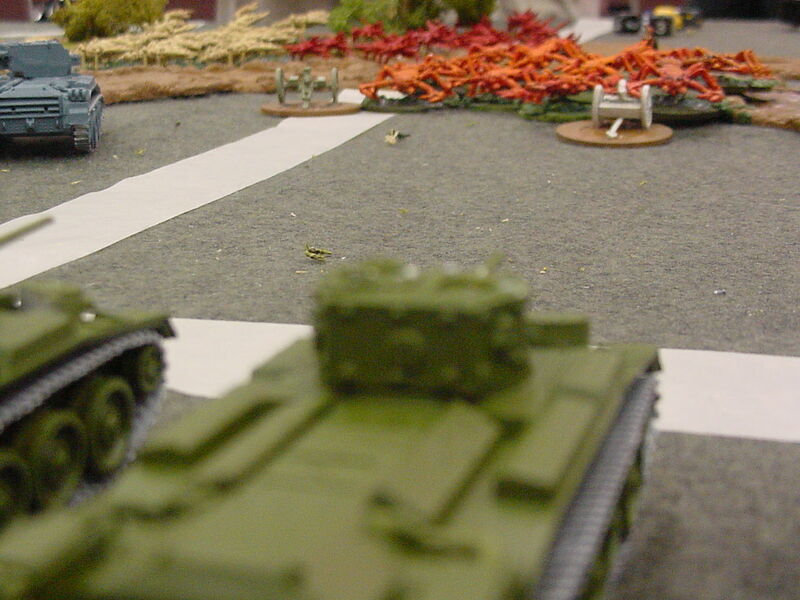 One company of Royal Marines and a R.A. Armoured Howitzer section he threw forward to cover the bridge approaches. The remainder of his forces he deployed on the banks of the River Otter, with a company of sailors in reserve and the two other R.A. howitzer sections in support. The Bugs hit the defences like a tidal wave, crashing into the advanced guard, which although they stood firm, their offer killing two giant warrior insects with his pistol, were overwhelmed. 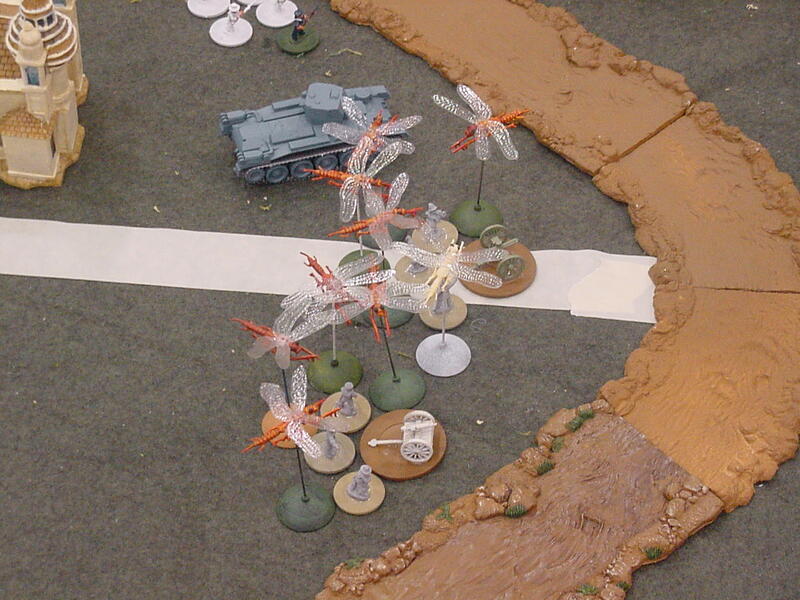 Along the river line the aliens were also able to wreak havoc, as their flying lancers fell upon the Royal Navy's machine gunners quickly stinging the crews to death as they defended their guns. Events on the bridge appeared to imperil the entire line. 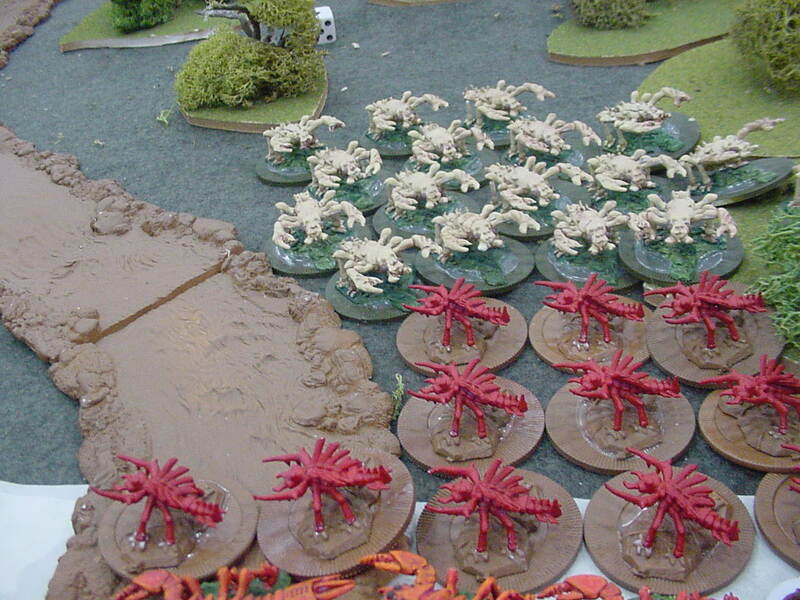 On the right flank the sailors stood fast firing volleys into the alien hordes. At one point the destruction of a number of drones caused the aliens to turn upon each other attacking their Hivemates in a melee that left dozens shattered and strew across a small copse of trees. The companies of sailors raised a great Huzzah, but their joy was short-lived as the aliens quickly regained their order and again began to move towards the ford. The crews of the machine guns lay dead by their weapons, but the ford looked secure as one of the howitzer sections and the sailors stood ready to hurl fire at any insects that threatened to cross. The sacrifice of the Marines and naval gunners around the bridge wasn't without reward as they were able to hold the enemy away from the bridge long enough for reinforcements, in the form of a company of the new Royal Armoured Regiment Mk I Land Fighting Vehicles, a Company of Royal Engineers in armoured vehicles, C Company First Gurkha Aerially Borne Rifles and 2nd Manchester, to arrive. Just as it looked like the line would solidify and the aliens would be thrown back they regained the initiative and their attack gained momentum. They surged across the bridge, climbing over the Royal Artillery's armoured howitzers, unable to damage them, yet not stopped by them either. The Royal Engineers vehicles were unable to advance to succour the advanced guard and watched as the last of the Marines were overrun. 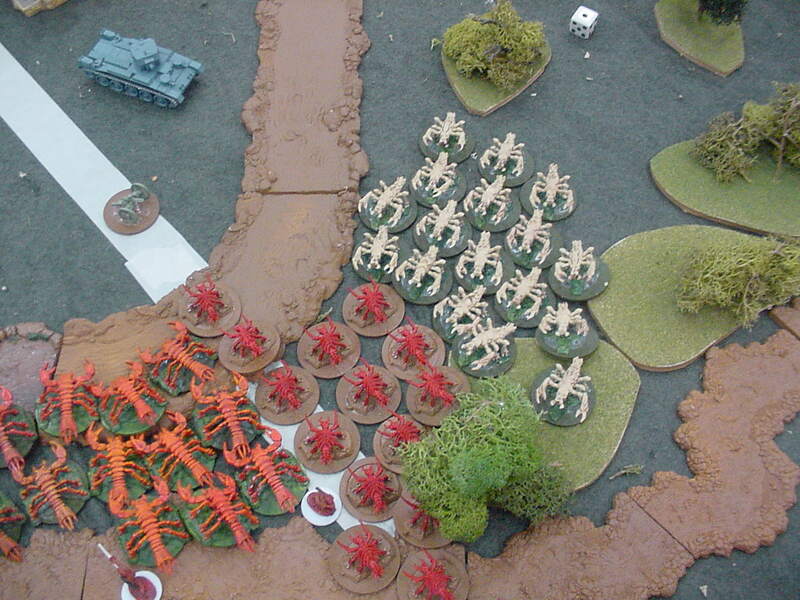 Even the flame throwers and spigot mortars of the new vehicles were not enough to slow a column of the horrible aliens as they bypassed the bloodsoaked ground the marines had defended and surged across the bridge. They struck the relief columns before the troops could deploy causing no small confusion and breaking the 2nd Manchester. The Gurkhas stood and fought, surviving with terrible casualties, but not leaving the field. The Right flank faired little better. The Naval Brigade came under a steady, sustained and accurate barrage of projectiles shot from the aliens, and took serious casualties. Three swarms of bugs broke through the line, taking casualties from the massed machine gun and 12 pdr fire of the Royal Armoured Regiment, but able to scuttle away towards Axminster and the supply depot.